You can still eat organic produce during the winter! Eating local and organic is one of the best things you can do for your body and your environment. When you stick with local, organic food, you’re ensuring that money and support go directly back into your community and that you’re ensuring a better future for you and everyone around you. 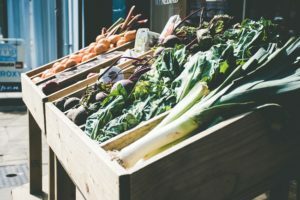 While you might think that eating organic is best suited for the summer, there are several ways you can commit to the cause all year round. In fact, there are plenty of vegetables that thrive in the winter. With a little know-how and curiosity, you can be enjoying local, organic produce all season long. You likely won’t be able to grow everything indoors, but several plants can thrive year-round given a sunny spot and watering. Microgreens, herbs, and sprouts all do well grown in containers. If you are feeling adventurous, and want to try for something more substantial potatoes, sweet potatoes, Brussel sprouts, and kale can all be planted in containers and brought in for the winter as well. There are a wide variety of plants that do well in containers, to try your hand at growing to make sure to speak with a professional at your local garden shop. Another winter growing technique is to build and grow small crops within a cold frame. While this system will not work as well in areas that get exceptionally cold temperatures, in the Maryland and Virginia area our winters are mild enough to allow for a cold frame to be effective. Cold frames use a system of covered and insulated beds to allow the interior and soil to stay an even temperature. Your local organic farms likely have a system of greenhouses and storage systems that allow them to grow and store wonderful organic produce throughout the year. Finding local farmers markets and Co-Ops is a great way to get access to these nutrient-rich, delicious foods all year long. There are a variety of ways to preserve produce to use all year long. Freezing is one of the easiest, and it causes the least nutrient loss, but canning is another option. Pickling is another excellent way to save some items like cucumbers, radishes, and carrots. Last but not least, joining a CSA is a great way to support a local farm of your choice while getting access to great food. Most farms offer a few varieties of CSA’s depending on interest, family size, and season. One of the benefits of a CSA is that you may get to try new foods you otherwise might not have. This entry was posted on Friday, December 7th, 2018 at 12:39 pm. Both comments and pings are currently closed.